It’s not the same as being homeless. Carson Graham teacher Rob Olson wants to be very clear about that point. 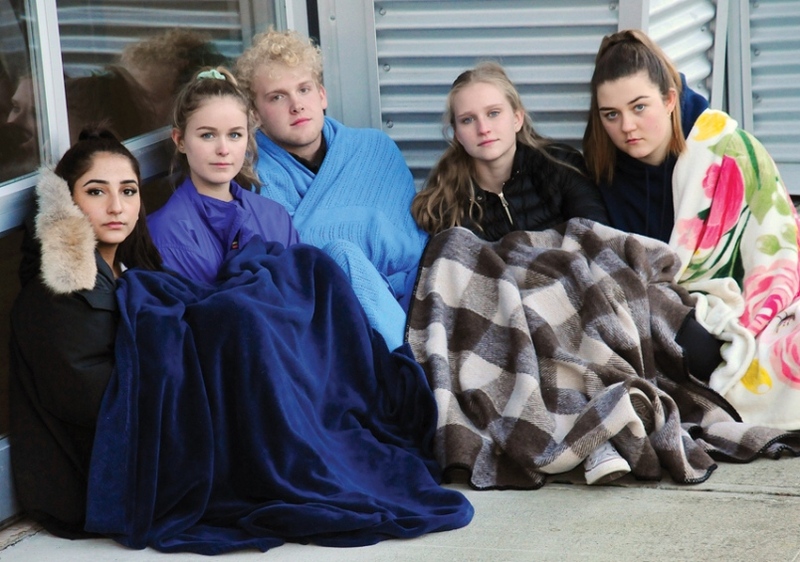 On Thursday night, about 32 students Carson Graham’s leadership program are slated to spend the night bundled up outdoors with only a piece of cardboard as a mattress overtop the pavement. The evening will be a bonding experience for the students and they’ll probably have fun, Olson says. “We’re doing this with a lot of humility,” he explains. But the kids will feel the cold. And if they don’t know already, they’ll get a sense of how terrifying glass breaking or sirens screaming can be at 3 a.m.
“We also want to give our kids a sense of reality,” Olson says. The sleepout is a fundraiser for Covenant House, an agency for homeless youth who have fled abuse or been forced from their homes. In Vancouver, there are between 500 and 1,000 youth living on the streets but the issue of homelessness is not confined to the Downtown Eastside, Olson notes. As a counsellor, Olson offered advice to a 13-year-old girl who was couch surfing. Her mother was suffering mental health issues and her father was violent, he recalls. “It does happen here,” he says. The problem is particularly acute among LGBTQ teens, Olson says. A 2017 study found LGBTQ youth were 120 per cent more likely to be homeless than their peers. “It seems like homelessness of all shapes and sizes is on the increase here in the Lower Mainland,” Olson says. Olson had wanted to do something to help at-risk youth for a while when North Vancouver school district superintendent Mark Pearmain asked if Carson Graham’s leadership program was willing to take part in the sleepout. After checking and finding out Carson Graham’s principal was supportive, Olson put the prospect of a night outdoors before his students. They instantly got it, he says. The class initially set a fundraising goal of $2,000. At press time, the class had rocketed past that goal with $5,820, $1,700 of which was raised by student Sophia Cross. “It’s actually quite inspiring for me as a teacher to work with such gifted and talented kids,” Olson says. Those talented kids are set to be joined by one late addition: North Vancouver-Lonsdale MLA Bowinn Ma. Ma is slated to join the students in the evening and sleep outdoors, according to her communications officer. Students in the school’s junior leadership program are also planning to help out by handing out backpacks and sandwiches in the Downtown Eastside. “What we’re trying to do as a school and an education system is ensure that our students are learning that message and that they understand the importance of community,” Olson says. Many youth living on the streets have suffered – or are suffering trauma – related to drug addiction, a death in the family, or their own mental health challenges. It’s just one, cold night. But it’s also a stark reminder of what a lot of teenagers have to contend with between dusk and dawn. To learn about the event or to donate, click here.